All about Commedia dell'Arte and the porcelain figurines made by hundreds of European porcelain factories of the Commedia characters. 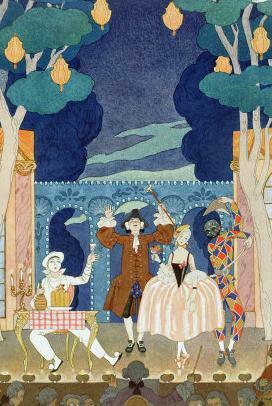 A Commedia dell'Arte novel, a comic fantasy set in Renaissance Italy, of sorts. Rave reviews by readers. An actor's handbook for Commedia dell'Arte. 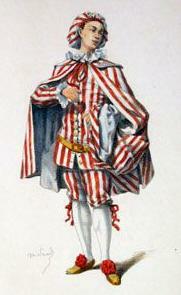 Arlecchino is one of the most lasting of the Commedia dell'Arte characters. Known in English as Harlequin, the general term for a clown, Arlecchino has been transformed into many types of clowns, leading indirectly to Charlie Chaplin's Tramp, also known as Charlot. 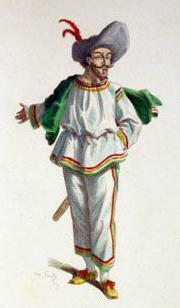 And Arlecchino is the indirect basis for the English puppet Punch. More below. 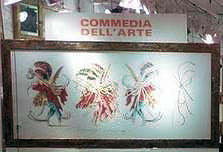 Commedia dell'Arte is a uniquely Italian improvisational theatrical form known throughout Europe since the 1500s as Commedia Italiana. In Italy, it was known as Commedia a braccio (Entertainments off-the-cuff). 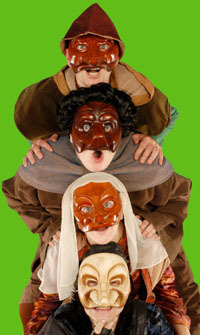 Stock characters, represented by standardized costumes and masks, peopled traveling theatrical troupes. They performed a repertoire of comic and melodramatic plays for courts, private merchant families and for the public, usually in a public square, at times in improvised theatres. Sometimes the characters took on different names but the characteristics and costumes remained the same so they were easily recognizable to the audiences. 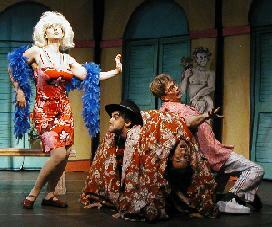 The characters, thin plotlines and slapstick were direct descendants of Ancient Roman comedic theatrical traditions. props associated with each stock character. These elements would be interwoven at will by the actors as they fleshed out the basic storyline, improvising whatever was needed, or whatever the crowd seemed to enjoy most. No two performances were the same. The story line generally consisted of young lovers impeded by old people, sometimes by a lusty old man who wanted to take the young woman for himself. 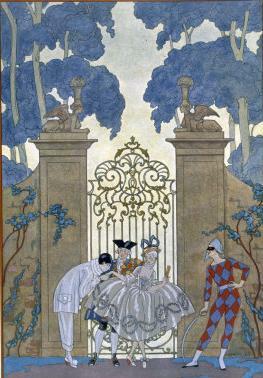 The young lovers would turn to their servants for help. Sound familiar? It should. It's the basic plotline for all the Marx Brothers movies. 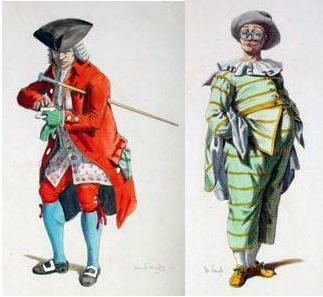 Below I describe and show some common Commedia dell'Arte stock characters. Before acting troupes formed, actors usually relied on local rulers and aristocracy to pay them to entertain their courts. As merchants became richer, they built private theatres and hired actors to perform for them, too, but not full-time. The merchants opened their private theatres to the public as a money-making venture. Those who could, paid handsomely for private box seats, while the others paid much less for a standing place in the gallery before the stage. 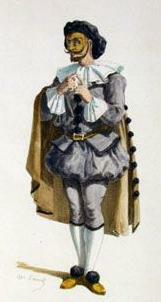 As more and more theatres were constructed, many actors began forming traveling troupes, who moved between these theatres and courts, performing their own versions of the Commedia dell'Arte standards. Stars headlined the troupes, guaranteeing audiences wherever they performed. 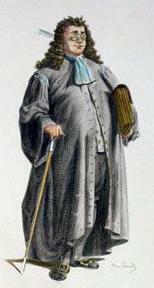 Vecchi - Old Players, who played the characters of Merchant, Doctor, Notary, Lawyer, Father, Soldier, Master. Zanni - Comics, who played the comic servant characters including the Cunning Male, the Cunning Female, the Dumb Male, the Goodhearted Female. Amorosi or Innamorati - Lovers, who played two sets of star-crossed lovers, the First Lovers and the Second Lovers. Musicanti - Musicians, who sang and danced at regular intervals throughout the performance, and in the towns to advertise the coming shows. Acrobati - Acrobats, who performed on stage and in the streets to draw a crowd. Many of these actors and musicians took on other minor roles as needed, such as poor professionals, soldiers, farmers. 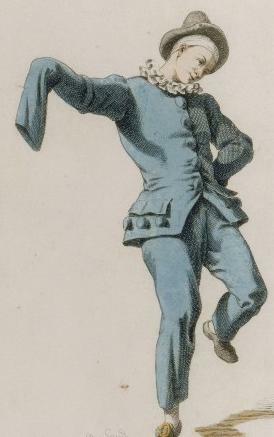 At the same time Commedia dell'Arte was making it's way across Europe, another theatrical tradition existed in Italy, too. 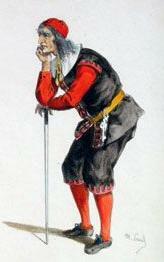 Commedia Erudita (Educated Entertainments) was the dry reading of scripted plays by academics to other academics. Eventually, with some help from the Italian playwright Carlo Goldoni, and from the French playwright Moliere, the two forms would be combined together to create a scripted theatre, populated by many stock characters. 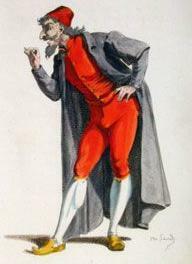 Commedia dell'Arte was adopted directly into the opera of it's day, stimulating what was called Opera Buffa, or silly opera. 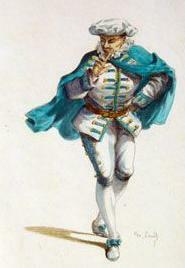 In their later works, those most often performed today, Carlo Goldoni and Moliere transformed Commedia dell'Arte's stock characters from one-dimensional props into more realistic multi-dimensional characters. Opera made the same transformation with the help of Mozart and his librettist Lorenzo da Ponte. Descendents of this theatre can be seen in every form of entertainment today, from mime, puppetry, television series, films, plays, to comic sketches. The situations and characters appeal to basic human nature, which is why they traveled well and remain entertaining today. They are human archetypes. Commedia dell'Arte in a modern form still exists, entertaining audiences around the world. Check the sites of these troupes to see where and when they perform. The Electric Theatre Company, formerly the Northeast Theatre, perform regularly including a recent performance of a new Marx Brother's story, and they teach a very fun sounding, hands-on course in Commedia dell'arte. They also offer a course in Italy in June and July called In bocca al lupo, Course details, Some Photos, More Photos, Comments from former Students. Teatro di San Carlino (Naples) A Commedia dell'Arte puppet theatre, the oldest continuous establishment of it's kind in the world. In Italian only. 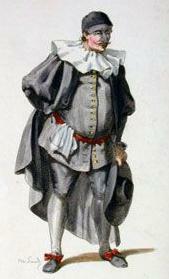 In Britain, Commedia dell'arte is called Pantomime or Panto. It is often performed during the end of year holiday season. Many of the stock characters were depicted in the popular marionette shows in appropriately sized theatres (Teatrino delle marionette) and in the puppet shows on the streets of Venice and other cities and in specially constructed theatres (Teatro dei burattini). Visit my page of reminiscences by a traveler to Venice in the 1860s for what these theatres were like, and why he found them more entertaining than human theatres. He also describes a visit to a Commedia dell'Arte show that left him enthusiastic with the casual, involving atmosphere of Italian theatre, where the behind the scenes antics of the performers happened before the scenes. Teatro di San Carlino (Naples) A Commedia dell'Arte puppet theatre, is the oldest continuous establishment of it's kind in the world. Their site is in Italian only. For children: the SimonRossi.it site has coloring pages of many of these characters. London's V&A Museum collection of Commedia dell'Arte paintings and more interestingly of marionettes. Be sure to view the 2, 3, and 4th pages for all the marvelous marionettes, strings included. Gardiner Museum Commedia dell'Arte porcelain statue collection. He is one of the oldest characters known, originally as Il Magnifico, who together with the First Servant, would entertain people in the streets for money from passers-by. He is a Venetian merchant, old master, who is pompous and foolish, rich and miserly, an indulgent father or a sexual predator of young women. He's known also as Cassandro, Zenobbio, Magnifico, Tartaglia (half-blind and stuttering), Tabbarino, Sior Tonin Bonagrazia (a very foolish Venetian). 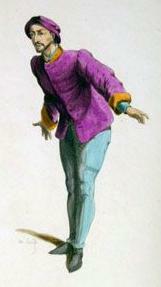 This is an image of Cassandro. And an image of the half-blind and stuttering Tartaglia. He is a Bolognese University trained doctor who is learned and respected by others, but who in reality is foolish, ill-educated as seen by his mangling of the language, and prone to pointless, learned debates while his patients die. He is known by many names, including Graziano and Balanzone and Boloardo, but the character is always the same. Traditionally in a theatrical troupes, and in most plays they performed, there was a First Servant (Primo Zanni) who is scheming, more clever than his master, semi-serious, poor, illiterate, from Bergamo, and a busy-body. He goes by many names, but most commonly by Brighella, Mazzetino, Giangurgolo, Gioppino, Tabarino, Pedrolino, Fritellino or Pierrot which is a later, more romantic version of the same character. Here's an image of Mazzetino. This is an image of Fritellino. 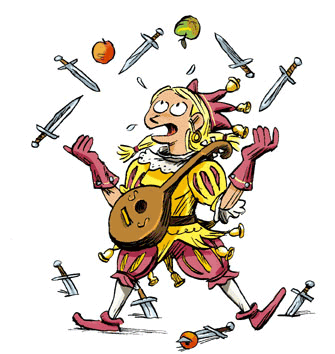 There is also a Second Servant (Secondo Zanni) who is stupid, foolish, poor, easily distracted, easily provoked into a fight, from Bergamo, sometimes carrying a stick, and always hungry. 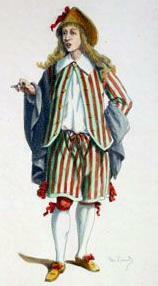 This character is generally called Arlecchino (Pulcinella is the Neapolitan version from which comes the English puppet character Punch), but is also known as Francatrippa, Polichinelle, Truffadino, Girandolaio, BeppeNappa (Sicilian version), Trivellino, Stentarello (Florentine version) or Burattino. Charlie Chaplin's Tramp character is known as Charlot outside the U.S., and is seen as a direct descendent of Arlecchino via Pulcinella. 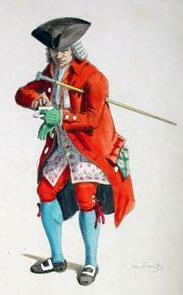 This is an image of the Neapolitan Pulcinella. Here's an image of the Sicilian BeppeNappa. 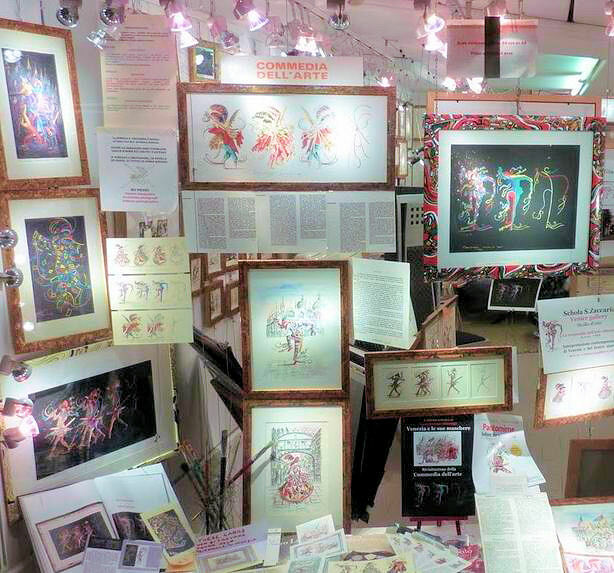 Here is an image of Florentine Stenterello. 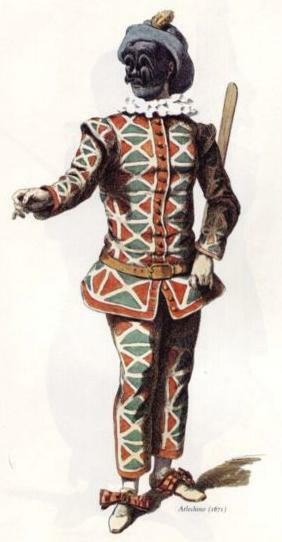 A variation of Arlecchino popular in Venice puppet theatres was the psychopathic character with the billy-club or night-stick who beat people to death after befriending them, in sang-froid, or cold-bloodedly, feeling no remorse what-so-ever. Other character in this same vein if a bit milder at times, are Ruzante, Macco, Fagiolino (Bologna, Dosseno, and Punch in England. This is an image of Ruzante. 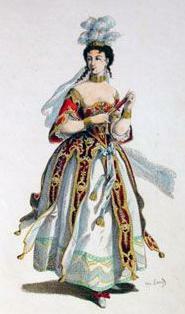 This is a female servant character, who is often paired with the Second Servant as his wife (in English she became Judy). She is often vicious, spiteful, wily, pragmatic, very clever, and Venetian. She goes by many names including Arlecchina, Corallina, Ricciolina, Camilla and Lisetta. A faithful personal maid to the Prima Donna who helps her survive the melodramatic travails of the story. Sometimes called Ragonda. 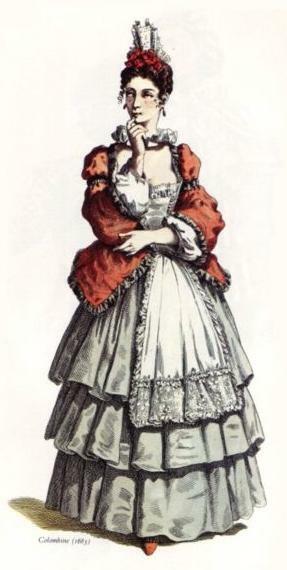 Another version is Bela Majin (Piedmont) who is the beautiful and loyal wife of Bicciolano, dressed red with a long head veil. Milanese usually, moral, dignified, wise and likes the quiet life. He transforms from servant to merchant and back again, and has several incarnations, such as Meneghino, Gianduja (Torino), Bicciolano (Piedmont). Here is good Sicilian Pasquino. 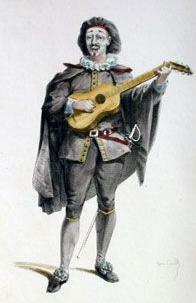 Scapino is the most famous musical servant. He's always depicted with an instrument. Coviello is another musical character that has a generally silly personality in whatever role he shows up. 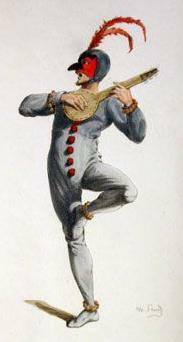 The French Scaramouche or Scaramuccia character is often with an instrument too. Here's an image of Coviello. This comic character had many names and personifications, but the characteristics are the same. He has a strong regional dialect and pretends to be better bred than he really is. Beltrame, Sandrone. This is an image of Beltrame. Also call Uomo selvaggio. A primitive, hairy man who responds to all his primitive urges. 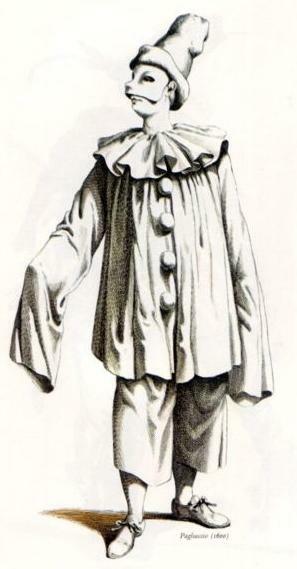 He's also used in plays as a wood nymph, causing all kinds of trouble for unsuspecting people who happen upon him. The Captain goes my many names, but the most popular is Capitan Spavento, image above. Spavento means 'fear' in Italian, which describes his character well. The Captain is a braggard soldier, vainglorious, Spanish or Neopolitan, a buffoon who considers himself a prize for any woman, and who is timid in combat. 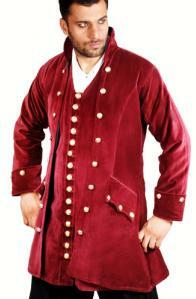 He's thought to be the basis of Shakespeare's famous character Falstaff. He's known variously as Capitan: Coccodrillo, Matamoros (more comical), Rinocerante, Narcisino, Scaramouche or Scaramuccia (France), Rugantino (Rome), Giangugolo (Calabria), Meo Pattaca. 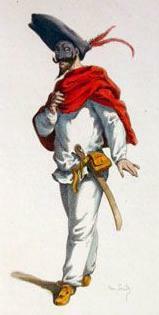 Meo Pattaca is based on a Roman mercenary character from a classic poem and play. This is the show barker, pitchman, salesman. He roams the town streets trying to draw in the crowds into the show. He would take part in a play by acting as the narrator, or playing any charlatan that needed playing. Saltembanco means jumps on the bench, suggesting he would often climb up on benches to be seen and heard in the busy streets. The humorous image above shows what the man might resort to in his job as barker. 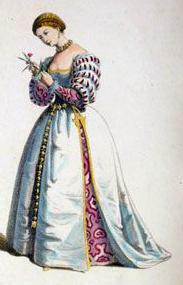 The first woman of a troupe, the Prima Donna, usually played the female romantic lead. Each performance had it's melodramatic element, star-crossed lovers, to please the softer emotions of the audience. There was also a handsome, masculine, young leading man to play her lover. They were both cultured, beautiful, elegant and eloquent. They went by various names like Flavio and Flaminia, Leandro and Isabella, Silvia and Silvio, Fiorella and Fiorello, Rosaura and Rosario. Think of the old Marx Brothers movies. They always had a story of young lovers in the middle of all the zany mayhem caused by the Zanni, the Marx Brothers, who tried to get the young lovers together while clashing with the establishment characters such as Doctors, Rich Men and Women, and the Captains of Police. Here's an image of Silvia. 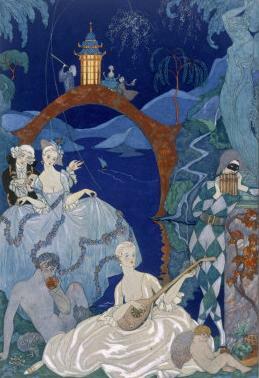 There was often in a troupe a set of Second Lovers, who many time played friends or rivals of the First Lovers. The actors doubled for other characters when needed, and entertained the crowds during the musical acts. Click through to my Venice Carnival page for some Venetian inspired characters associated with Carnival. 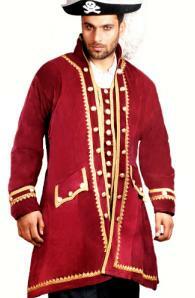 Visit my Costumes page for more generic costumes you can purchase for parties and Carnival. Venetian artists celebrate the Commedia dell'arte characters (masks) to this day, mainly because they are popular costumes for Carnival. 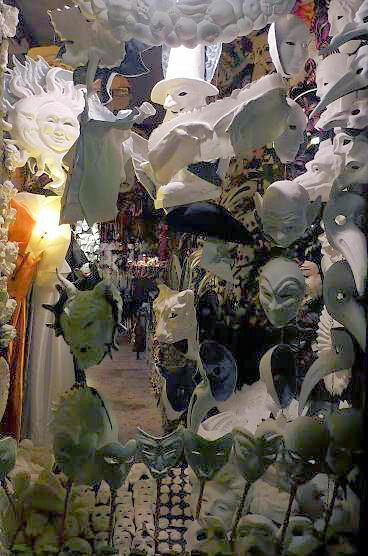 These are two shop windows photographed in Venice in 2011. HUGE SALE going on now at Costume Craze - 60% OFF! Here are most of the ones that would work best for the Commedia characters. 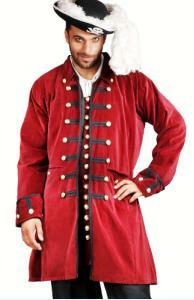 Halloween Costumes for Women - This Super Deluxe Renaissance Costume includes the Renaissance costume dress, the hat and the overcoat. 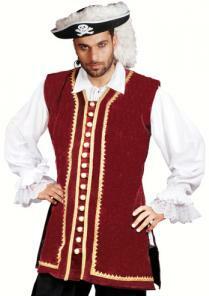 Adult Halloween Costumes - This Adult Renaissance Wench Costume includes the mid-length Renaissance Wench Costume dress with attached top skirt drape, gold trimmed stretch velvet lace-up vest and the hat. Halloween Costumes for Women - This Adult Maid Marian Costume from The Designer Collection features the headpiece with jewel, top with back lace-up, sleeves, skirt and the corded belt. Great couples costume with your man dressed as Robin Hood! This Super Deluxe Medieval Maiden Costume features the full-length panne gown with attached cape, sash and buckle, and the headpiece that can also be worn as a necklace. Necklace shown is not available. Plus Size Halloween Costumes for Women - This Plus Size Baroness Costume includes the baroness costume dress and the headpiece. Adult Hallowen Costumes - This Deluxe Arwen Dress and tiara features the lovely and flowing Arwen dress and tiara. Available in size Adult Standard. Great for a couples costume with your man dressed as Aragorn! 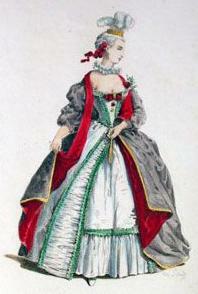 The dress is a pale green. Adult Renaissance Costumes - This Adult Renaissance Baroness Costume includes the Baroness costume dress and the headpiece. 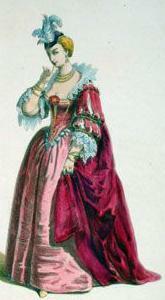 This Deluxe Renaissance Maiden Costume features the full-length gown and the headpiece with drape. 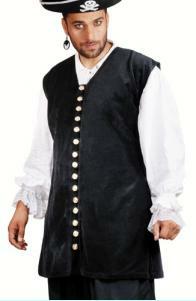 This Plus Size Super Deluxe Musketeer Costume features the shirt with attached gold satin trimmed apron, hat with feather and the boot tops. Pants not included. Sword sold separately. Deluxe Clowns Costumes - Be happy, be playful in the delightful Premier Harlequin Clown Costume which includes the black & white stretch bodysuit with ruffled collar & cuffs, ruffled peplum, hat, black & white socks & white gloves. Small 33-34.5 bust, 25-26.5 waist, 35.5-37 hips Medium 35-36.5, bust 27-28.5 waist, 37.5-39 hips Large 37-39.5 bust, 29-31.5 waist, 39.5-42 hips XL 40-43 bust, 32-35 waist, 42.5-45.5 hips Excellent material and quality workmanship. Halloween Costumes for Women - This Adult Noble Lady Costume from The Designer Collection features the hat with emblem and veil, dress with fur trim, beads, lined sleeves and the corded belt. This Plus Size Deluxe Renaissance Maiden Costume features the full-length gown and the headpiece with drape. 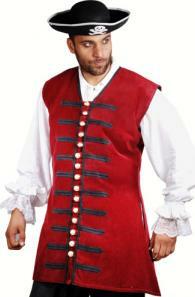 Adult Halloween Costumes - This Adult Renaissance Peasant Costume includes the micro-suede lace-up Renaissance Peasant costume vest, shirt, waist sash, pants and the boot tops. 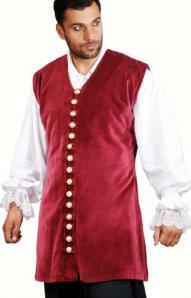 Adult Halloween Costumes - This Super Deluxe Renaissance Wench Costume includes the shirt, Renaisance costume vest, the skirt with overpiece and the pouch. 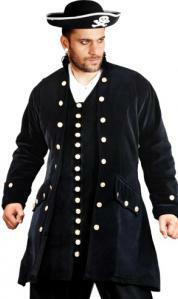 Can also be used as a pirate wench costume. Womens Large: Sizes 14-16. Costume runs big. This Renaissance Woman Costume includes the Renaissance costume gown with smocked neckline and double skirt, vest with gold trim, hat, vinyl belt and the drawstring pouch. This Super Deluxe Elegant Empress Costume features the full-length gown with elaborate collar, sleeve and bodice detailing, tiara headpiece with drape and the necklace. Adult Super Deluxe Renaissance Maiden Costume - Renaissance Costumes for Women - Adult Halloween Costumes - This fabulous Renaissance Maiden Costume includes the corset with attached sleeves, Renaissance costume skirt with attached sash and drape, and the Renaissance headpiece. This Black and White Feathered Mask features a body of short black feathers, seequined trim about the eyes and a magnificent crown of sleek black and gold feathers. 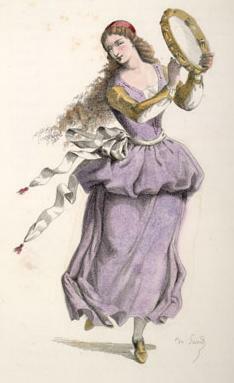 This fancy mask features a flared white feathered body, magenta sequined trim about the eyes and two proudly curving peacock plumes on the crown. This Black and Silver Mask on a stick with red flower accent is great with a Vampire Costume or a Dia de Los Muertos Costume, Spanish Costume, Mexican Costume, or for a Masquerade Ball outfit! This Magique Half Mask is available in black (MASK138), silver (MASK137), red (MASK136) and gold (MASK96). Silver and white venetian mask with iridescent sequin trim. This Shedevil Half Mask is held in place by an elastic string that goes around the head. This Harlequin Half Mask is available in black, white, red, silver and gold. This White and Silver Feathered Mask features a white sequined body with silver sequined accents, an opulent feather spray and three magnificent shining silver flowers. Perfect for an angel or christmas costume! This Onyx Pearl Feather Mask in Silver and Black features a richly sequined silver body and black trim, a sleek black feather spray and rosettes and two long pearly streamers. This magnificent Spanish Peacock Feather mask features a red sequined and jeweled body and gold trim, sweeping flare of red and peacock feathers and a gold rosette with streamers of red ribbon and gold beads. This Black and Grey Feather Mask features a subtly reflective black body, black sequined trim and a spray of short black feathers capped by sweeping charcoal grey plumes. Perfect for any masquerade or ghostly costume! This magnificent black mask features a sunburst in silver and gold across a black mask, a silver jewel embellishment and sweeping black plumes. This Black and White Feather Mask features a pristine white body, silver sequined trim and a striking sweep of black and white feathers embellished with a clear jewel. This Black and Gold Feather Mask features a plain black body accented by a dramatic spray of plumes from the crown and a delicate fan of peacock feather forming a veil over the face. This Hand Held silver and red mask with red feathers features a bright silver spangled body, a red sequined trim and a coy feathered rosette over a dramatic spray of red plume. This magnificent mask features a sparkling gold body, gold sequined trim and a sweeping spray of red and black iridescent feathers embellished by a sequined gold flower. This Feather Mask in Mardi Gras Colors features a sparkling gold body with blue sequined trim and a ruff of jaunty green and purple quills. Perfect for a mardi gras costume! This magnificent Feather Mask in Mardi Gras Colors features a body of delicate spotted feathers in green, yellow and purple and then flares out into a mane of long quils in the same colours, crowned by soft downy feathers and a spray of proud peacock feathers. Truly a singular way to finish off your mardi gras costume! This extravagent mask features a body of small spotted black and hot pink feathers and a magnificent crest of black, green and red feathers crowned by proud sprays of peacock plumes. Marvelous for mardi gras! This handsome deluxe mask is adult sized and features a black body with gold trim. This Deluxe Adult Black Mardi Gras Mask features gold trim and fancy floral beadwork. This Deluxe Adult Purple Mardi Gras Mask features gold trim, feathers and tassles. Deluxe Adult Gold Mystique Mask with black feathers and gold trim. Great for a mardi gras costume! This Deluxe Adult Red Mystique Mask with feathers and gold trim features a beaded embellishment and an asymetrical line. This Deluxe Venetian Adult White Cat Mask with feathers and whiskers is great for any white cat costume, and also makes an excellent mardi gras mask! This Deluxe Adult Venetian Black Cat Mask with gold trim, a jeweled nose, plush and feather embellishment and whiskers. Great for a cat or madri gras costume! This Deluxe Adult Gold Mardi Gras Mask is the height of elegence and is sure to turn heads when paired with your mardi gras costume! This Deluxe Adult Gold and Black Sequin Mask features diamond shapes in gold trim and sequins and dangling ribbons and sequin streamers. Great for a jester or mardi gras costume! This Deluxe Adult Multicolor Sequin Mask features classic jester diamond designs in multicoloured sequins and dangling ribbons and sequins streamers. Great for a jester or mardi gras costume! Deluxe Black Mardi Gras Mask with lace and stones. This Deluxe Adult Black Sequin Mask with Stones features handsome black braid trim, sequined embellishments, bead fringe and rhinestone accents. Truly a mask for the royalty of carnival or mardi gras! This Deluxe Adult Fancy Gold Mask with gold trim is ideal for a mardi gras costume! This Deluxe Adult Gold Venetian Butterfly Mask features gold braided trim and rhinestone and gold embellishments, and a gold sequined rosette. Great for a butterfly, carnival and mardi gras costume. This Deluxe Adult Venetian Black Cat Mask features a complex design, white braided trim, jetty jewels and marabou 'fur'. Perfect for a cat costume or a mardi gras costume! This Deluxe Mardi Gras Mask on Stick features the purple mask with green, gold and pink sequins and a spray of green, blue and gold feathers and matching streamers. This Deluxe Adult Black Mystique Mask features silver reflective dots, black sleek feathers, shining silver trim and an exotic dangling bead embellishment. This Black and White Domino Mask is of a classic design and is perfecto for completing your harlequin or mardi gras costume! This Black and White Burst Eye Mask will add a dramatic touch to any carnival, harlequin or mardi gras costume! This Black and White Checkered Domino Mask looks fabulous when paired with a carnival, mardi gras or harlequin costume! This Black and White Zebra Mask is a striking and unusual piece and would go smashingly with a harlequin, carnival or mardi gras costume! This opulent Pink Lace Mask features black lace overlayed a pink body, a sheer frilled trim, a black satin rosette and lace and satin ribbon streamers. This gorgeous Black & White Mask features criss-crossing ribbons studded with clear jewels. Ideal for a harlequin or mardi gras costume! This fancy Black Feather Mask features a sunburst of gold braid and shining black ribbon on a matte black base, a jeweled diadem and a spray of sleek black feathers. Ideal for a mardi gras or carnival costume! This classic Red & Black Venetian Mask features gold curlicues and red anc black diamon shapes on a créme background. Perfect for a harlequin or mardi gras costume! This Exotic Venetian Witch Mask features a bronze and purple colour finish over a white base and includes an eyemask portion and hat portion, edged with decorative tulle. Wonderful for a witch costume or a mardi gras costume! Venetian Mardi Gras Mask - Gold trimmed jester mask with musical note accents. This festive Venetian half mask is two colored and a perfect fit for your made grass or masquerade costume. 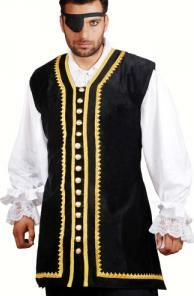 These two companies also ship worldwide, and specialize in Renaissance, Medieval and Pirate costumes. Here are a few that would do well for Commedia costumes, but click through to the shop to see their full range of beautiful women's costumes, too.